After the expected frivolities died down it was pretty quiet last night considering we were well and truly overnighting in a city. Emma did the parkrun, which definitely helped to make us feel we'd salvaged quite a bit from the trip given the various maladies. I feel rough now though so it feels like it's been the right decision to head back to Dieppe (coordinates) where we're currently waiting for the boat. We'd only been parked here for 30 seconds when a French man of about 70 approached us and started a hearty conversation, fully in French, whilst making appreciative gestures towards the truck. Emma showed him the living quarters and he was fascinated. He then went on to tell us (as far as we could decipher, anyway) about the failed attempt by the allies to take Dieppe in a full-frontal assault but then spoke with much jubilation and genuine gratitude about how 1944 was from the French perspective when the 'liberating' allies returned to see of the Germans once and for all. He was, without doubt, enormously grateful; even today. He even (we think) invited us to his house 15km out of Dieppe for free food and some free diesel. We very politely (we hope) turned him down but left with a firm handshake and not a little humility. 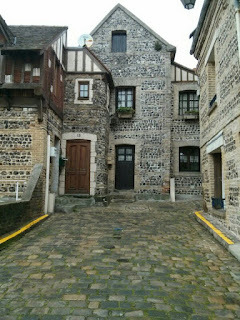 In spite of feeling groggy, we managed a very short walk around Dieppe and once off the busy thoroughfares we found some very characterful cobbled streets and delightfully quirky houses (pic).